For my first proper post I thought I’d start out as I probably will be going on – with a whisky. 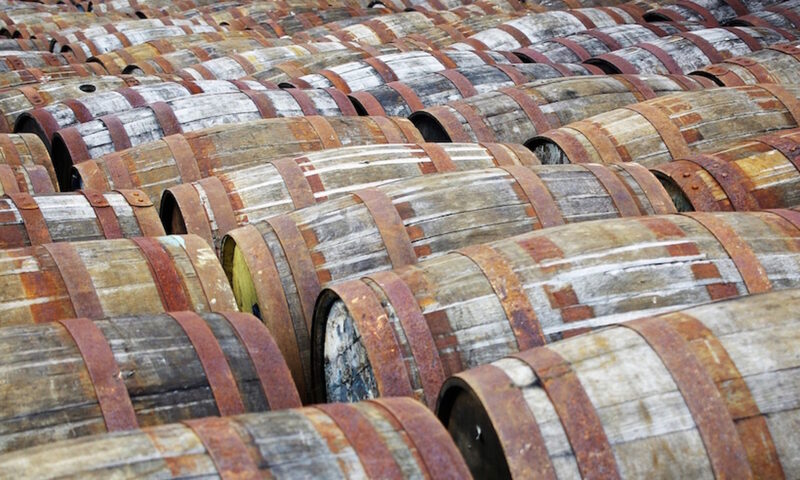 Compass Box are a whisky company known for their blending skills. Blends have got a bit of a bad name in recent times, but until the late 70s the concept of single malt whisky was fairly alien to most people. The standard blend that you see hanging from an optic is a load of cheaper grain whisky doctored with some single malts to create a hopefully tasty whisky. While many single malt fans turn their noses up at them there are a few good’uns, but Compass Box’s fare is something quite different. John Glaser, the man behind the blending, is known for his skill at bringing together whiskies to make rather special bottles and I’ve been meaning to pick up one for a while. They change the available whiskies quite often, making the blends in small batches, but Hedonism is a name that has recurred pretty much constantly since the first bottling. Each batch is different, but as far as I can tell working towards a similar idea. There is normally a conceit behind each whisky family that they put out and Hedonism is no different – it’s made of grain whisky. Grain is normally considered the poor cousin to the malt whisky that most people drink, mainly used for blending, but, as I’ve discovered recently through the Scotch Malt Whisky Society‘s single grain bottlings, it is not always the case. One of my introductions to non-blended whiskies was with grain when I unknowingly picked up a bottle of Black Barrel as I wandered through duty free shortly after entering the world of work and disposable income – I rather liked it and was quite shocked to find that it was made of ‘inferior’ materials. According to the website Hedonism is made up of between 8 and 15 different grain whiskies, generally matured for over 20 years, and this definitely shows up in the glass, albeit with a delicate flavour. Colour-wise it’s quite light and yellow, contrasting from my initial preconceptions that it would be a dark and sticky dram. On the nose it’s quite poky, with a hint of the back of the chem-lab, with pear drops and a hefty slug of alcohol. Without water it’s quite strong, feeling more than its bottled strength of 43% and tastes quite different to a regular malt – it’s sweet but with a lingering bitterness and a light rubbery taste creeping around the sides of the tongue. A drop of water definitely helps it in my opinion, knocking off some of the burn and opening up the sweetness into its component parts, but emphasising the quite sour and bitter aftertaste – icing sugar fading to fisherman’s friends, with a hint of woodiness. I didn’t get much of the toffee promised on the website, but such is the problem of small batch bottlings – sometimes you get one that is at the extreme end of the flavour range. All in all this isn’t really a whisky for me – it’s quite delicately flavoured despite its alcoholic kick, missing out on the big mouth feel that I normally go for, and the finish is definitely on the bitter side for my liking, which the lighter whiskies I enjoy don’t tend to. It’s interesting and I can see similarities between it and the other grains I’ve tried over the years, but in the end they chose the flavours that I’m not all that keen on. If you’re a big fan of rubbery whiskies and are looking for something more delicate then this might be something to look at, although be wary that each bottle you find will probably taste different. Update: This one’s been wearing at me for a while, as I’ve changed my mind a number of times – I don’t quite agree with my final thoughts any more. 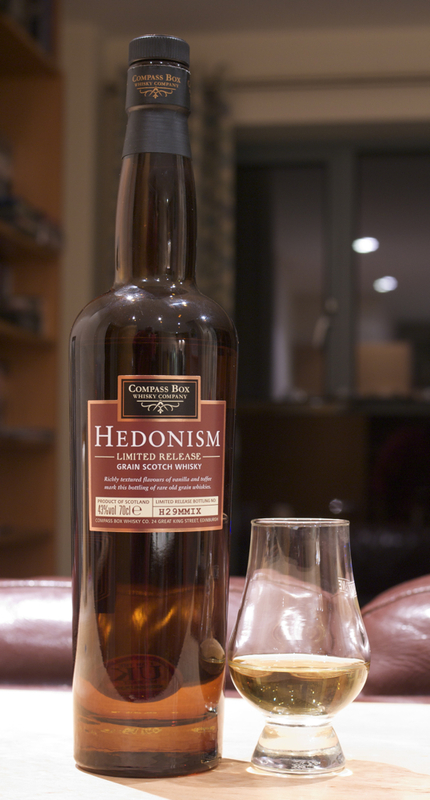 Firstly, I’ve tried Hedonism in a few other places now and it’s always been the same, the differing batches isn’t something that I’ve heard from the rather solid production line of Compass Box, however it seems my tastes are not – from day to day my opinion on the whisky changes, with the flavours I don’t like one day being my favourite the next. It’s still not one that is definitely for me all the time, although the Hedonism Maximus is definitely something I need to try more often, but when I’m in the mood it’s really very nice. Widely available – I got mine in Waitrose. That is a fantastic name for a whiskey though. I am really enjoying the blend I have at the moment, it is a bit too much of a jolt at the beginning but the smoky flavour at the end is just lovely. I had some tonight and I can still smell it permeating the room it is that smoky. I’m intrigued by the Hedonism but only if you rate The Peat Monster for me, one of my definite favourites! Liz: What are you drinking at the moment? Rich: I’ve tried the Peat Monster before and it was rather good. Quite peaty… It’s on my list of things to grab a bottle of sometime. I’ve got some Smokehead at the moment, so my big smoky whisky needs are met for the time being.